Life Giving Force has designed and built our very own low tech manual UV water purification system. 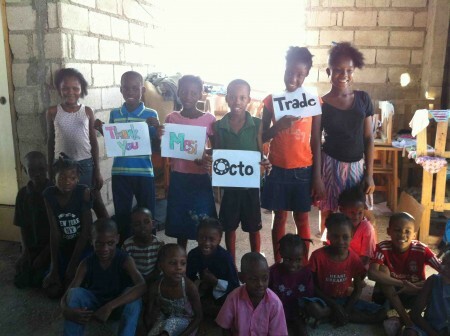 Thanks to our partners, Octo-trade Japan, we installed our very first system in the La Main Tendre Agape Orphanage in Port-au-Prince just last week. Prior to the earthquake, La Main Tendre Orphanage housed all of its children in a large comfortable building with a free school. The earthquake destroyed that structure as well as the school. The orphanage is slowly rebuilding all of its compound to ensure that the kids have a safe place to take refuge. LGF is very pleased to take part in the rebuilding of the orphanage and are proud to say that all of the little children at Agape now have access to clean drinking water. LGF is excited about our new systems (designed and built in Haiti) and pleased to be able to help ensure that the most disadvantaged in Haiti have access to clean water. This entry was posted in LifeGivingForce Foundation, Partners, Stories, Uncategorized and tagged clean drinking water, Clean water as Human Right, clean water technology, Haiti, LifeGivingForce, orphanage. Bookmark the permalink. Post a comment or leave a trackback: Trackback URL.